Explore the Southwestern corner of Sardinia and its unspoilt beauty with wild dramatic coastlines and crystal-clear waters. Hike along the Costa Verde among dunes and wildflowers, past abandoned mines, ancient watchtowers and natural granite breakwaters with incredible views of the surrounding coast. A private transfer will take you from Cagliari to Montevecchio, where you will spend two nights in a family run Agriturismo surrounded by nature. Here you can relax or take a dip in the pool, admiring the Sardinian sea at a distance. Your evening meals are include while staying here and are provided by the host, allowing you to try some traditional Sardinian cuisine. Montevecchio is one of the most ancient mineral mining sites in Italy. This morning you have the option to go on a guided tour (there are 4 different tours of about 45 minutes) of the abandoned mine site of the Miniere di Montevecchio. In 2007 this mine was added to the UNESCO list of Geoparks. After visiting the mine you can enjoy a circular walk in the Croccorigas forest, thick with ilex groves, cork oaks and home to Sardinian indigenous deer. The dunes of Piscinas are some of the tallest in Europe and located next to Sardinia's most beautiful beaches. Today's walk explores this desert, and for about 6 km it is likely to be just you, the sea, the sand and the wind! The last part of the walk is on gravel roads to the Agriturismo Fighezia, where you spend the next two nights. If you arrive early you can enjoy exploring the gardens or relaxing on the veranda. Today you head back to the sea (Scivu beach) then take a footpath into the Mediterranean macchia or shrubland, leading you to a panoramic view point on the Cape Pecora granite headland. This strip of pink granite shaped by wind and water juts out into the blue sea, considered to be the gem of the green coast. Continue along to Portixeddu, a 2.5 km white sand beach famous for surfing which is bordered by dunes, with forests of pines, oaks and junipers offering shelter during hot summer days. After relaxing on the beach return to Portixeddu by a different path. Today you have a taxi ride of around 1 hour to the ancient fishing village of Porto Paglia. Take time to explore the village before starting today's walk along a very wild and remote coastline. The route you follow is a sandy footpath with stunning views of the cliffs. This walk is not suitable for people who suffer from vertigo, since there are a couple of sections with no railings close to the cliff's edge. The path then winds down to Portoscuso where you spend the night. Portoscuso is home to a 16th century Spanish Tower, the 17th century church of Madona d Itria as well as the famous tuna fishery, all worth a visit. First thing you hop on the ferry to the port of Carloforte on neighbouring San Pietro Island. Today's walk starts climbing on a secondary asphalt road towards the north side of the Island, where at the end of May they start the so-called Mattanza, a system of nets that for about 45 days catch tuna fish. Walk back to Carloforte from where you will take the ferry to Calasetta and then a private transfer takes you to the town of Sant Antioco on the island of the same name where you spend the last two nights of this holiday. Once a Phoenician Carthaginian colony, then a Roman city, today Sant Antioco is a charming seaside town. Wonder through the streets and admire the coloured houses, maritime history and impressive churches as well as the working fishing port. Today starts with a short drive to Cape Sperone, from where you walk back to Sant Antioco. During today's walk you pass by the imposing watchtower of Torre Cannai, once the backbone of the medieval defence system. Following on past the watchtower the path takes you to the beautiful beach of Maladroxia, a popular spot for surfers and windsurfers when the Maestrale wind blows (winter and spring). The last part of the walk back to Sant'Antioco town is alongside the asphalt road. You will need one main piece of baggage and a daypack sufficiently large to take everything needed for your walking day, such as your water bottle, snacks, spare clothing and camera. Your main luggage will be transferred to your next accommodation. Please clearly mark all your belongings with your name and the name of the next accommodation and have your bags ready and at the reception by 09:00 on the morning of your departure. For this trip you can fly into and back from Cagliari Airport. At the start of your trip you can fly into Cagliari Airport. 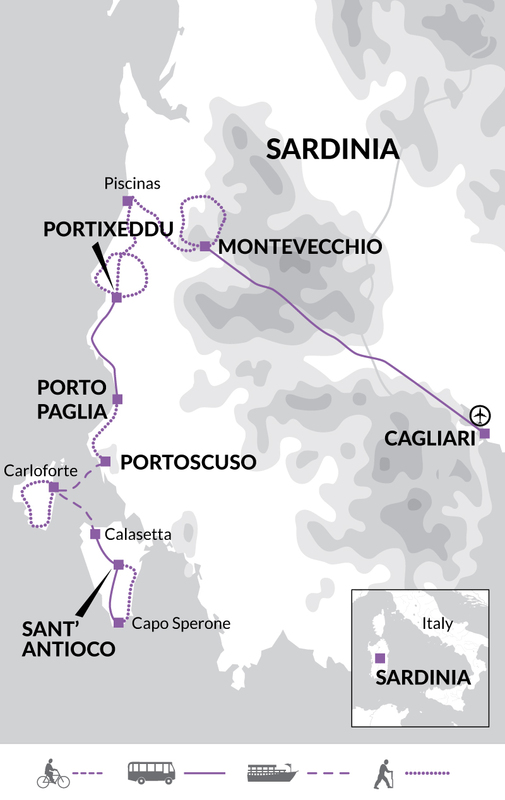 A private transfer will take you from Cagliari airport to Montevecchio, where your trek starts. From Sant\ Antioco, where the trip ends, you can take a bus to Carbonia (http://www.arstspa.info/801.pdf) and then a train from Carbonia to Cagliari Airport. 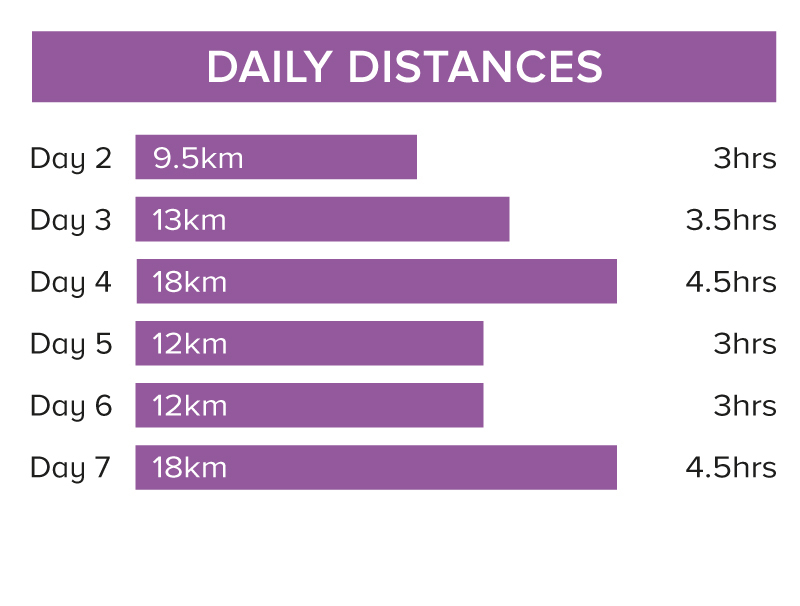 On this journey you walk 82 km over 6 days (an average of 14 km per day). The two longer walks can be shortened by taxi transfer to the starting point (5km on day 4 and 4km on day 6). The walks are on various terrains: gravel road and paths, in the forest, along a beautiful rocky and sandy beach, following rocky coastal footpaths, sometimes through low vegetation/bushes and along mule tracks, along remote sandy footpaths by high cliffs, with a few sections of secondary surfaced roads as you enter the villages and towns. We have graded the route as moderate. Mon 1 Apr 2019 - Mon 29 Apr 2019 Your trip can depart anytime between the above dates. Contact us for triple room requests and solo traveller prices. Tue 30 Apr 2019 - Wed 12 Jun 2019 Your trip can depart anytime between the above dates. Contact us for triple room requests and solo traveller prices. Thu 13 Jun 2019 - Mon 24 Jun 2019 Your trip can depart anytime between the above dates. Contact us for triple room requests and solo traveller prices. Tue 25 Jun 2019 - Sun 14 Jul 2019 Your trip can depart anytime between the above dates. Contact us for triple room requests and solo traveller prices. Mon 15 Jul 2019 - Thu 25 Jul 2019 Your trip can depart anytime between the above dates. Contact us for triple room requests and solo traveller prices.